With an established reputation for quality and service throughout Ireland since 1980, Munster Tool Co. is successfully expanding its network via franchising. A business that provides solutions, Munster Tool Co. supplies the latest specialised tools to automotive mechanics and maintenance technicians to aid them in completing their work faster, safer and more effectively. As Munster has established relationships with the main automotive dealers, garages and mechanics, franchisees are able to start with a comprehensive list of customers based in their territory. With immediate access to over 10,000 individual line items, the franchisee provides an essential service to the sector. Established in 1980, when Martin McMahon and Donal Healy identified a gap in the Irish market, Munster Tool Co. has come a long way since its beginnings as a one-van operation. Now based in a custom-built, state of the art warehouse and administrative centre in Co. Cork, Munster Tool Co. has built relationships with the major suppliers of quality tools worldwide. With this help, Munster Tool Co. has been able to develop a comprehensive franchise package and the first franchise was launched in 2004. 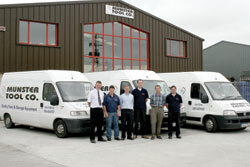 Since then, a further eight franchisees have joined the network. Aided with a full training programme, franchisees are confident in all aspects of the business - from product, knowledge, operating procedure, sales skills and business and management training. Franchisees are constantly supported throughout their business development and refresher training is offered every three months to enable you to stay ahead of the game. Benefiting from nationwide promotions and advertising campaigns, each franchise continues to reinforce Munster's high levels of brand recognition. With Munster's dedication to product innovation and ongoing market research, coupled with a huge customer base and a massive array of products to offer, franchisees have everything set in place for the makings of a successful business. • Since 1980 Munster Tool Co has been supplying customers in 32 counties with the world's leading brands of specialised automotive tools and equipment. • Our initial training covers the products, sales skills and business management. • Munster Tool Co. carries out ongoing market research and product innovation to ensure that the latest products are available to its franchisees.